More than 50 languages are spoken in the state of Oklahoma. There are 55 distinct Indian tribes that make the state their home, and each of these tribes has its own language or dialect. The colorful history of the state includes Indians, cowboys, battles, oil discoveries, dust storms, settlements initiated by offers of free land, and forced resettlements of entire tribes. Oklahoma's Indian heritage is honored in its official state seal and flag. At the center of the seal is a star, and within each of the five arms of the star are symbols representing each of the five tribes (the "Five Civilized Tribes") that were forcefully resettled into the territory of Oklahoma. The tribes depicted on the seal are the Creeks, the Chickasaw, the Choctaw, the Cherokee, and the Seminoles. The present Oklahoma state flag depicts an Indian war shield, stars, eagle feathers, and an Indian peace pipe, as well as a white man's symbol for peace, an olive branch. "Unassigned Lands" in Oklahoma were offered to settlers through a series of "Land Openings" where newcomers initially competed for the land in horse races. The Land Run of 1889 began the process of disposing of these Unassigned Lands. The Homestead Act of 1862 provided that a legal settler could claim 160 acres of public land, and those who lived on and improved the claim for five years could receive title. People who entered the district illegally to lay claim to lands, before the designated entry time, were called "Sooners." The name came from a section in the Indian Appropriations Act of March 2, 1889, that said that nobody would be permitted to enter upon and occupy the land before the time designated in the President's opening proclamation and that those that did would be denied rights to the land. This section became known as the "sooner clause." Early legal settlers had a very low opinion of Sooners of course. This began to change by 1908 when the University of Oklahoma named the football team the "Sooners." Like many nicknames, this one's negative connotations faded over time and the name, Sooners, is now worn with pride. Though not official, Oklahoma is popularly known as "The Sooner State." he terms "Boom" and "Boomer" were first used by Dr. Morrison Munford in the Kansas City Times in reference to the effort to establish settlements in the "Unassigned Lands" and to the people involved in those efforts. Promoting the "Boomer's Paradise," early advocates of settlement in the Unassigned Lands began what is referred to as the "Boomer Movement." The Boomer Movement was initiated before the Unasigned Lands were legally opened for settlement. Early Boomers included James Madison Bell a Cherokee, who tried to settle in the Cherokee Outlet and Kansas and Missouri settlers, organized by Kansan Colonel Charles C. Carpenter, who entered Indian Territory and tried to settle along the North Canadian River. These Boomers were evicted by U.S. Troops. In 1880, David Lewis Payne led a party of 21 settlers to the south bank of the North Canadian River and laid out a town called Ewing. They were removed by the U.S. Fourth Calvary. Payne continued to flaunt the government's proclamation forbidding unlawful entry into Indian Territory and returned to Ewing with a larger group of settlers. Judge Isaac Parker levied a $1,000 fine against the Boomer leader for his second intrusion. Mr. Payne's arrest seemed to make him more popular and he continued to guide Boomers into the forbidden territory. When David Lewis Payne died suddenly, of a heart attack, in 1884, his lieutenant, William L. Couch, assumed leadership of the Boomer Movement and lead four more excursions into the Oklahoma territory. Again and again the Boomers were arrested and expelled from the area. Illegal intrusions by Mr. Couch ended in 1885. The Boomer Movement gained new momentum in 1886 and 1887 when the Santa Fe Railroad constructed a line that ran from Arkansas City, Kansas to Gainesville, Texas right through the Unassigned Lands. At this time political pressure was exerted to open up the Unassigned Lands to settlement. In 1889 an amendment to the Indian Appropriations Bill allowed President Benjamin Harrison to proclaim the Unassigned Lands open for settlement. 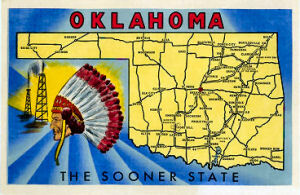 People who live in Oklahoma or who come from Oklahoma are called Oklahomans or Oklahomians. Sometimes Oklahomans are referred to as Sooners. The first commemorative quarter-dollar coin released in 2008 honors Oklahoma, and is the 46th coin in the United States Mint's 50 State Quarters® Program. Oklahoma, nicknamed the "Sooner State," was admitted into the Union on November 16, 1907, becoming our Nation's 46th state. The Oklahoma quarter features an image of the State bird, the Scissortail Flycatcher, in flight with its distinctive tail feathers spread. The bird is soaring over the State wildflower, the Indian Blanket, backed by a field of similar wildflowers. The coin's design also bears the inscriptions "Oklahoma" and "1907." The depiction of Indian Blanket (or Gaillardia) symbolizes the State's rich Native American heritage and native long grass prairies that are abundant in wildlife. Oklahoma was formed by the combination of the Oklahoma Territory and the Indian Territory of the Five Civilized Tribes -- Choctaw, Chickasaw, Creek, Seminole, and Cherokee. The State's name is derived from the Choctaw words "okla" and "homma," meaning "red" and "people." The process to choose the coin's reverse design began in February 2006. Citizens submitted more than 1,000 concepts for consideration. This eventually led to the creation of ten narratives based on these concepts. A vote by Oklahoma citizens narrowed the field to five, which were sent to the United States Mint for consideration. The final artistic renderings, developed by United States Mint Sculptor-Engravers and artists in the United States Mint's Artistic Infusion Program, were then proposed to Oklahoma for a statewide vote. On April 30, 2007, Governor Brad Henry announced his recommendation of the State bird and wildflower design, based on the overwhelming number of citizen votes for this design. The Department of the Treasury approved the design on May 25, 2007. Four other designs were considered, including "Pioneer Woman and Child with Windmill and Oil Derrick," "Pioneer Woman and Child with State Outline and Oil Derrick," and two versions of "Pioneer Woman and Child with State Outline and Calumet." Oklahoma (From Sea to Shining Sea) , by Linda Saylor-Marchant. 80 pages. Publisher: Scholastic Library Publishing (September 2003) Reading level: Grades 3-5. Presents information about Oklahoma's people, geography, history, landmarks, natural resources, government, state capitol, towns and cities, and more. 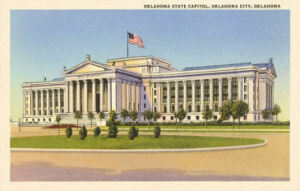 Oklahoma (World Almanac Library of the States) , by Michael A. Martin. 48 pages. Gareth Stevens Publishing (October 2002) Reading level: Grades 4-6. Filled with the most up-to-date information, including the latest Census results. Full-color photos bring to life the story of Oklahoma. In addition to an in-depth factual profile of Oklahoma in the form of a state Almanac, this book offers fascinating and lively discussions of the state's history, people, geography, government, economy, culture, and lifestyles. A section on Notable People, a calendar of events, and enough primary source documents, time lines, maps, and other tools to make this unquestionably the best young adult reference material on the USA available anywhere. Oklahoma Almanac 2007 / 2008 , published by the Oklahoma Department of Libraries. 99 pages. The Oklahoma Almanac , published by the Oklahoma Department of Libraries and formerly known as the Directory of Oklahoma , has been called the "accepted information authority" on the state since 1907. Similar to other state's Blue Books, the Almanac includes information on Oklahoma's state agencies, and the executive, judicial, and legislative branches of government. The Almanac also includes election results, county statistics, a tourism section, a wildlife and nature section, Oklahoma history, federal government contacts, lists of Oklahoma museums and statewide associations, and more. Oklahoma: A History , by W. David Baird, Danney Goble . 342 pages. Publisher: University of Oklahoma Press (October 31, 2008) The product of two of Oklahoma's foremost authorities on the history of the 46th state, Oklahoma: A History is the first comprehensive narrative to bring the story of the Sooner State to the threshold of its centennial. From the tectonic formation of Oklahoma's varied landscape to the recovery and renewal following the Oklahoma City bombing, this readable book includes both the well-known and the not-so-familiar of the state's people, events, and places. W. David Baird and Danney Goble offer fresh perspectives on such widely recognized history makers as Sequoyah, the 1889 Land Run, and the Glenn Pool oil strike. But they also give due attention to Black Seminole John Horse, Tulsa's Greenwood District, Coach Bertha Frank Teague's 40-year winning streak with the Byng Lady Pirates, and other lesser-known but equally important milestones. The result is a rousing, often surprising, and ever-fascinating story. Oklahoma history is an intricate tapestry of themes, stories, and perspectives, including those of the state's diverse population of American Indians, the land's original human occupants. 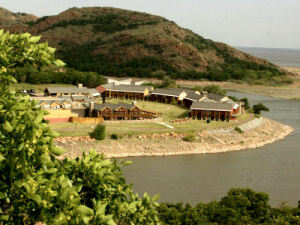 An appendix provides suggestions for trips to Oklahoma's historic places and for further reading. Enhanced by more than 40 illustrations, including 11 maps, this definitive history of the state ensures that experiences shared by Oklahomans of the past will be passed on to future generations. Oklahoma: A History of Five Centuries , by Arrell Morgan Gibson. 316 pages. Publisher: University of Oklahoma Press; 2 Sub edition (December 1981) The drama and the excitement of the Oklahoma story unfold from the prehistoric residency of Clovis man and Folsom man and the Spanish and French explorations in the early historic period through the removal of many diverse Indian tribes to the federally-designated Indian Territory and into the modern period of Oklahoma politics and economic advancement. Gibson informs his readers with refreshing candor. Betrayal of the Indians, racism, and political corruption are told in their entirety. The acheivements of the state and its people are related with pride as the story progresses through the early years of statehood and the hardships of opening pioneer farms and building new towns. The effects of the Great Depression are told, revealing the Oklahomans were coping with drought and depression lone before the rest of the nation. Later chapters tell of the vibrant modern period in Oklahoma, when its politics became more sophisticated, when its economic base expanded as the result of the recruitment of industry to the Sun Belt, and when science and technology opened the new frontiers of the space age. Of equal importance to modern-day Oklahomans is the successful growth of the humanities and the arts, with increasing appreciation of the state's rich Indian heritage. Historic Oklahoma: An Illustrated History , by Paul F. Lambert, Kenny A. Franks, and Bob Burke. 384 pages. Publisher: Published for the Oklahoma Heritage Association [by] Historical Pub. Network; 1st edition (March 15, 2000) As a state, Oklahoma is young. Admitted to the Union in 1907, Oklahoma statehood predates only four other states--New Mexico, Arizona, Alaska, and Hawaii. But the land that would become Oklahoma is old, and the area has a venerable history and pre-history that is rich in fascinating people and dramatic events. Historic Oklahoma examines the geology and pre-historic animals and people that occupied the region. Later the area was caught up in the struggle for empire between England, France, and Spain, while vast herds of bison and various tribes of Native Americans roamed across the land. With the Louisiana Purchase of 1803, the region became part of the United States, and a great drama of exploration, forced settlement of numerous Indian tribes, the establishment of the Indian Nations and Oklahoma Territory, a Civil War, the range cattle industry, land runs and land lotteries, coal mining, railroad building, oil and gas exploration, and statehood movements took place. Throughout the 20th century, Oklahoma's history has been no less dramatic. Drawing on a deep well of pride, optimism and determination, Oklahomans have overcome both natural and man- made disasters, rebounding in each instance to build a better state and quality of life. The people of Oklahoma have been prepared well by their heritage, if they choose to study and preserve it, to meet the challenges of the new millennium. Roadside History of Oklahoma , by Francis L. and Roberta B. Fugate. 99 pages. Publisher: Mountain Press Publishing Company (June 1, 1991) Roadside History of Oklahoma invites tourists and residents alike to use the state's highways as avenues connecting the present with the past. Drive along the stage route used by the Butterfield Overland Mail, or follow the Chisholm Trail as the first cowboys did after the Civil War when they drove cattle to railheads in Kansas, or cross the state on "America's Main Street," Route 66.